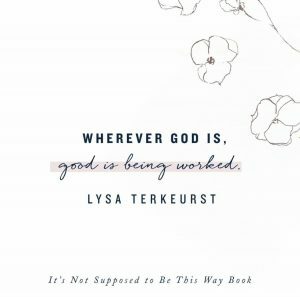 Lysa TerKeurst | Page 3 | Leading Women in the Adventure of Faith This precious person kept my fingers, sometimes flying, sometimes trembling, still clicking the keys until they became pages of words. She was worth wrestling through my tangled thoughts until they finally flowed like a healing balm for the hurting heart. She was on the top of my mind during all those whispered prayers, “show me how to understand this and teach this, God.” And who was this beautiful soul? You don’t have to fight through your disappointments, tears, and unanswered questions alone. That’s exactly why I want to invite you to be a part of the FREE study Proverbs 31 Online Bible Studies is doing of my new book, It’s Not Supposed to Be This Way starting on January 21st. •	A free download of Mack Brock’s new single, “Into Dust,” inspired by the book. •	Automatically entered into a drawing to win a copy of the It’s Not Supposed to Be This Way audiobook. •	Exclusive access to the weekly teaching videos that accompany the It’s Not Supposed to Be This Way curriculum during the Online Bible Study. You’ll be a part of an incredible community of women and learn biblical truths to get you through life’s hardest circumstances. Find unexpected strength when you sign up to join us here. Watch the Release Day Live Event Replay! Why would a good God allow hurt? The worst kind of lonely for me is being surrounded by people and yet still feeling utterly alone. I can feel it at a restaurant full of noise and activity and people talking loudly over one another. I can feel it in a mall bustling with crowds and overhead announcements and music meant to move everyone along. I can feel it even in a house full of voices I know with all the typical background noises of this place I call home. The world is spinning, people are connecting, and music is playing … and there I am in the middle of it all, smiling on the outside but crying on the inside. It’s like one of those Broadway show moments when all the other actors are frozen in a moment of activity, but the spotlight gets thrown on the unsuspected girl stage left. She sings a sorrowful solo about all that’s going on inside her world. And the brokenhearted ballad strikes a chord inside the part of us that feels so very alone as well. We swallow hard, because it could so very easily be us singing that same song in the midst of the crowds of our life as well. Never have I understood this feeling more than when my marriage hit the roughest of places, and I didn’t know who to turn to for help. Part of the problem was I didn’t know exactly what was going on. But the other part of my silence was because I wasn’t sure what to say or who was safe to say it to. So I just walked through my days pretending to connect with others while feeling so very isolated. Since I’ve broken my silence about this, I’ve been astounded by the number of women who feel the same way. They’ve slipped me notes in person or through social media that admit how very alone they feel because of a hurt they haven’t been able to talk about or process. This is a huge tactic of the enemy. He knows if he can isolate us, he can influence us. He can make us so consumed with the hurt and convinced it will never get better that we miss one of God’s greatest gifts. God created us to do life in a community of believers where we can go stand on someone else’s faith when our own gets shaky. People who can help us see the hope in the midst of our hurts. Friends who pray more words over us than they speak to us. Fellow journeymen who can share their testimony of heartbreak turned healing, so we don’t get swallowed up by the pain of our similar circumstances. God designed us to help each other. Look at the very first two humans recorded in the Bible, Adam and Eve. Genesis 2:18 tells us, “The LORD God said, ‘It is not good for the man to be alone. I will make a helper suitable for him’” (NIV). Throughout the Bible, we see our need for each other clearly communicated. “Two are better than one, because they have a good return for their labor: If either of them falls down, one can help the other up. But pity anyone who falls and has no one to help them up” (Ecclesiastes 4:9-10, NIV). “Therefore encourage one another and build each other up, just as in fact you are doing” (1 Thessalonians 5:11, NIV). “They triumphed over him by the blood of the Lamb and by the word of their testimony” (Revelation 12:11a). Oh, how I love that last verse. God’s message of hell-defeating hope is often most powerfully preached from the lips of those whose pain has been turned into the purpose of helping others. Who do you need to share your tears with? Who needs to know they aren’t alone? I know how hard it is to open up about our deepest disappointments. I deeply understand how terrifying vulnerability can be. But I also know there’s someone else in the world who would drown in their own tears if not for seeing yours. And when you make one other human simply see they aren’t alone, you make the world a better place. Father God, I’m so grateful You don’t waste any of my tears. 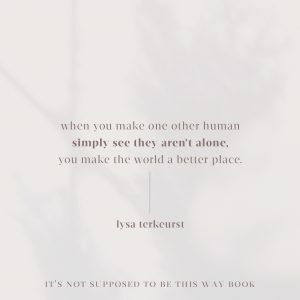 I want to take these lessons I’m learning in the midst of my own brokenness and use them to help someone else feel less alone, less broken, less hopeless. In Jesus’ Name, Amen. One of our deepest desires here at Proverbs 31 Ministries is to reach those who feel painfully alone in their circumstances, and provide a safe place for them to get connected and get their hopelessness redirected with solid teaching and honest testimonies. If you have ever needed the exact message you received from Proverbs 31 Ministries through one of the many ways we reach out daily, will you consider partnering with us financially, so we can continue reaching those who are desperate for connection and hope? You can give here today. It’s hard when a situation doesn’t look anything like we thought it would. Especially if you’re like me, and you like a plan. I like all involved to follow along with the plan. And I certainly don’t want any unexpected deviations from or disappointments with the plan at all, ever. In reality, though, life is highly unpredictable. I keep bumping up against this as I walk through a long season of life not looking like I thought it would. I suspect many of you are also facing circumstances that have left you feeling caught off-guard and unsure about what tomorrow holds. Maybe you’re in a job where you feel unsettled, and you think that God is leading you somewhere else, but He hasn’t yet revealed what’s next. So, for now, you walk into an office every day giving it your all, but your heart feels disconnected and your real calling unfulfilled. Or maybe you’ve been watching everyone else in your life find love, walk down the aisle, and start the life you’ve dreamed of. Then a few months ago you met someone who was everything you’ve been hoping for. You told your friends this might be the one. And then this week you felt that person pulling back. It’s hard to understand. You feel panicked. But the more you press in, the more distance you feel between the two of you. There are thousands of scenarios that evoke these feelings of uncertainty, fear and exhaustion from life not being like you thought it would be. “In this world you will have trouble” (John 16:33b, NIV). “Each day has enough trouble of its own” (Matthew 6:34b, NIV). All this trouble is exhausting. Walking in the “I don’t know” is scary. And sometimes we can be desperate to make things easier than they really are. We keep thinking, if we can just get through this circumstance, then life will settle down and finally the words happily ever after will scroll across the glorious scene of us skipping happily into the sunset. But what if life settling down and all your disappointments going away would be the worst thing that could happen to you? What if your “I don’t know” is helping you, not hurting you? “I have told you these things, so that in me you may have peace. In this world you will have trouble. But take heart! I have overcome the world” (John 16:33, NIV). The crucial detail for us to have peace in the middle of everything we face is to stay close to the Lord. We think we want comfort in the I-don’t-know times of life. But comfort isn’t a solution to seek; rather, it’s a by-product we’ll reap when we stay close to the Lord. Let’s cry out to God, declaring that this hard time will be a holy time, a close-to-God time. And let’s choose to believe that there is good happening, even in these places. Because wherever God is, good is being worked. Father God, I’m forever grateful for Your presence and all that You offer me as I rest in You. More than I need You to fix anything in my life, I need You. In Jesus’ Name, Amen. Do you ever struggle with knowing how to encourage a friend walking through difficult circumstances? Discover how to help her navigate hard realities with real help from God’s truth with my newest book, It’s Not Supposed to Be This Way. You can order your copy here today.